Driving through the busy streets of Addis Ababa, our driver Damena offhandedly mentioned that we were driving past Lucy. I looked at everybody in the backseat and said “Is he talking about ‘THE LUCY’? ?, the earliest discovered human ancestor Lucy?? ?” Damena said, ‘Yes, the ape. She is in the National Museum.’ Those of us in the backseat looked at each other with a look that said “we have to go see her ”. No trip to Addis Ababa is complete without visiting Lucy. When we arrived at the National Museum the next day, it was down-pouring and it quickly began to hail, so we ran inside the building, splashing through the already flooded streets. The museums power was out so the only exhibit visible was Lucy’s. In the lower level of the museum we saw the many relative ancestors of Lucy and the depiction of the family tree of human kind. 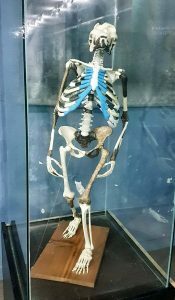 Lucy the Australopithecus was dug up in 1974 by a group of scientists in an isolated spot in the Afar region of Ethiopia. The night they dug her up they were playing a Beatles cassette and the song “Lucy in the Sky with Diamonds” was playing. Someone suggested that they name her “Lucy’ and the name just stuck and she became even more human. The National Museum took great pride in highlighting the fact that she was found in Africa by showcasing her with the phrase “AND THE WORLD BECAME AFRICAN”. Take a look at her reconstructed cast skeleton!